There are many types of joint compound and it can be difficult to know which to use. Fortunately, there are just two types to be concerned with; drying type drywall compound and setting type drywall compound. Each has a purpose when its time for drywall repairs. This is the most common type, also known as drywall mud. Typically available premixed in 1 and 5 gallon buckets or boxes. The main advantage to using premixed drywall compound is that it is ready to use right out of the box or bucket. Usually some mixing with water is needed to adjust its workability. Another plus is there is little waste. Any remaining drywall mud can be covered with water and the mixing bucket sealed and used again at a later date. The 1 gallon buckets are good for small patches and the 5 gallon bucket is enough to tape and finish an average room. There are three types of premixed drywall compounds. Taping Compound – Used for taping and the second coat. It is a strong drywall compound that has very little shrinkage as it dries and resists cracking. Topping Compound – Used for the final coat. It is easy to use, dries quickly and sands smooth. Can be applied over taping compound or All-purpose compound. All Purpose Compound – Can be used for all phases of drywall finishing, from taping to the final coat, even the texture. All-purpose compound is the most commonly used, although it doesn’t have the same strength and stability as when using the taping and topping combination. All drying types of joint compounds must be used in temperatures above 55° degrees Fahrenheit in order to properly dry. The dry time is affected by temperature, humidity and airflow. The compound must dry completely and thoroughly between coats. Dries through water evaporation that can take as much as 24 hours. This type of drywall compound is very different from other types of drywall mud. This type dries through a chemical reaction and is typically very hard. Available as a powder with drying times ranging from 5 minutes to 90 minutes depending on the type used. I often use either 45 minute or 90 minute when repairing small areas. The best part when using a setting type joint compound is once the patch is hard another coat can be applied. I don’t have to wait for the drywall patch to completely dry before recoating. Plus, it has excellent bonding capabilities to a variety of surfaces. Other benefits include less shrinkage and cracking, also it is much harder than regular All-Purpose drywall mud. 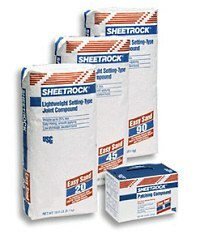 This makes it the perfect choice for patching corner bead or any patching that needs to be done quickly. Given so many benefits why would anybody use another type? There are disadvantages such as harder to sand, plus it’s more difficult to use, requiring more effort to produce a smooth joint or patch. Also this type of compound set up quickly, you should only mix as much as you can use in the time allowed. I have noticed that the setting time on the bag is for recoating and not the working time of the mixed compound. This depends on temperature, humidity and the amount of water used to mix the compound. Patches and Repairs – Use the powdered setting type joint compounds for a quick repair. These will allow you to patch and even paint on the same day. Finishing Entire Rooms – The drying types are your best choice. Only a professional finisher should use the fast drying setting compounds to finish an entire room or a very large repair. Texturing – Whenever a large area needs texture All-Purpose drywall mud should be used. It dries slowly and is much easier to work with. When mixing any type of compound use the least amount of water possible to have a workable consistency. To much water can cause cracks and force you to recoat more than you should. Regular spackle is fine foe small repairs. Fore larger or deep repairs use fast setting drywall mud. Many hardware and paint stores sell small wall repair kits that will do the trick. 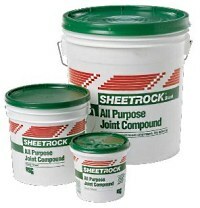 Are there any fuming adhesives or glues or borates in these joint compound products? What are they made of anyway? There are adhesive compounds in many products. The exact type is not known as this is proprietary information. With that said the main part of all wallboard products is Gypsum or Limestone with other minerals such as Talc or Mica. Every type of product from different manufactures will have their own formulas. Do you know of any drywall joint compound that does not have v.o.c.s in it? I have a customer who says she is allergic to v.o.c.s Thanks. I’m not aware of the VOC content of drywall compounds but it should be very low. Powder compounds might have a lower VOC content than the “wet” types in their buckets. You will need to contact some of the manufactures for more specific info. Is stirring mud good or bad? And Why? Stirring isn’t needed unless thinning. Puts the mud into a nice consistency when thinned. Is too many RPM’s then some air could get trapped in the mud, usually not a problem. Stirring when needed is good.